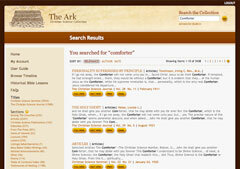 The Ark is simple to access and easy to use. Immerse yourself in one of the most comprehensive electronic collections of Christian Science periodicals available today, preserved for your enjoyment and benefit for many years to come. Click on the screenshots below to enlarge each image, and see for yourself what The Ark has to offer. 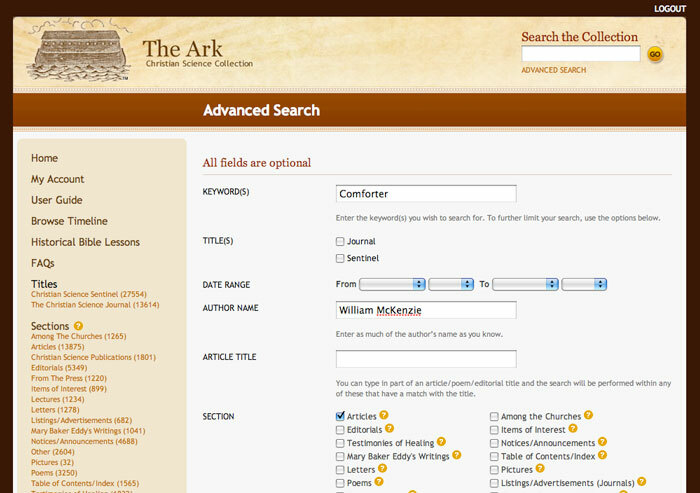 Start your search of Journals and Sentinels by using the Search the Collection field located on the upper-right corner of the Home Page. 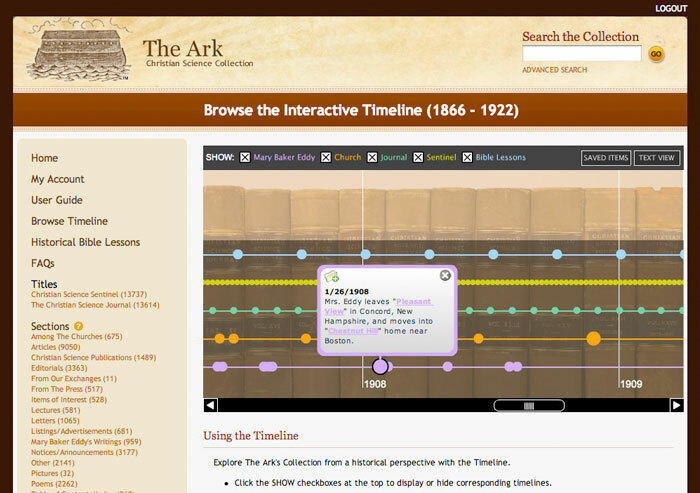 You can also access The Ark's other features, including the Historical Bible Lessons and the Timeline, from the Navigation Bar located on the left side of each page. 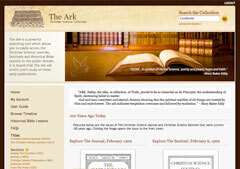 If you don't know where to begin, try the 100 Years Ago Today feature of The Ark. Located on the Home Page, this element of the software displays the Journal and Sentinel issues current one hundred years ago. Use The Ark's powerful search engine to navigate, print and share items from public domain (1883-1922) Christian Science periodicals. The easy-to-use format will clearly display the items found, along with textual snippets pulled from each item's content to preview. Sort your results or narrow your search by title, section, date or author using the Navigation Bar on the left side of the page. 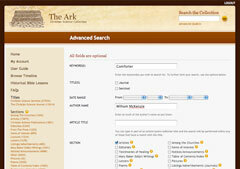 Use the Advanced Search capability of The Ark to specify multiple search criteria at one time. Quickly filter material to narrow your search results and find exactly what you are looking for. 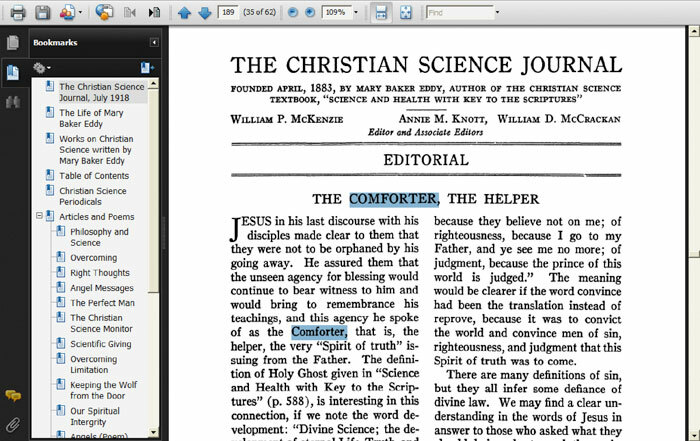 In this example, all articles written by William McKenzie that mention the word "Comforter" will be returned. 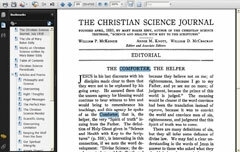 Benefit from the more than 55,000 pages of public domain Christian Science periodicals by simply clicking your mouse! Each Journal or Sentinel issue is viewable as either a full issue or a single item. Keyword searches highlight the word or words you specify within every listing it displays. Bookmarks in all full issues present the most important information of each publication in an easy to view and simple to navigate format. 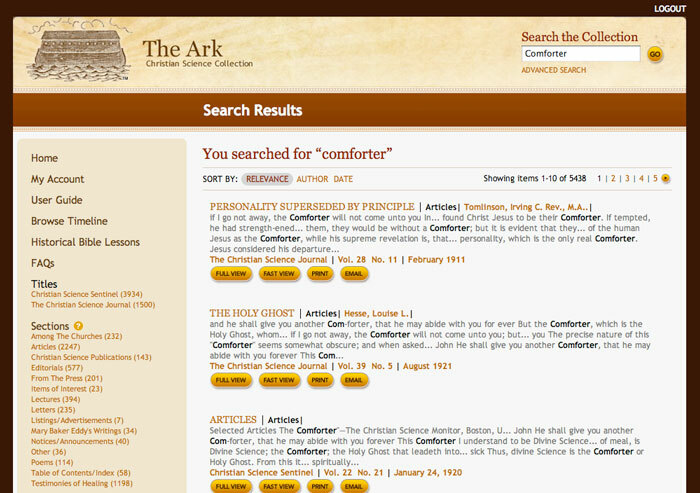 This example reveals an editorial by William McKenzie, one of many results for the keyword search of "Comforter." 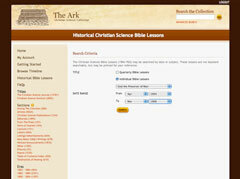 Enter The Ark to view historical Christian Science Bible Lessons from 1904-1922. These lessons can be searched by date or subject and printed for your reference. Two formats are provided for your ease of use: complete publications of The Christian Science Quarterly Bible Lessons and individual Bible Lessons for a specified week or subject. 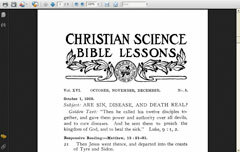 Examine historical Christian Science Bible Lessons from 1904-1922, faithfully preserved for accuracy. These lesson citations correspond with the latest version of Science and Health as Mrs. Eddy left it. 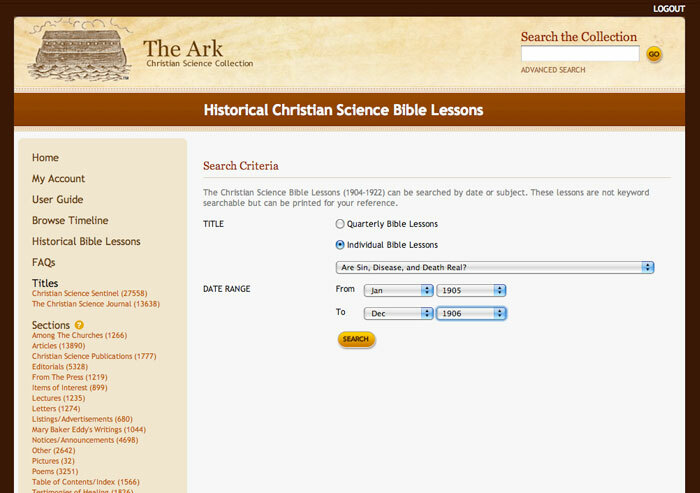 The Bible Lessons can be sorted by date or subject and printed for your reference. This example shows the October 1, 1905 Bible Lesson with the subject "Are Sin, Disease, and Death Real?" 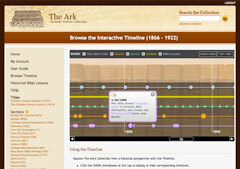 Study The Ark's collection in a historical context by using the Interactive Timeline feature. 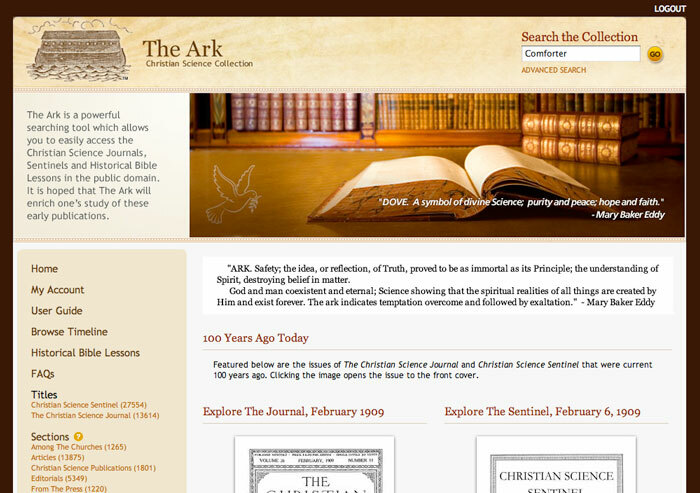 Gain new insight on the significance of published works in The Ark's collection by viewing key events for the Church and Mary Baker Eddy side-by-side with the publications of the periodicals. Select the timeline(s) you would like to display and examine an event in time by placing your cursor over the marker on the timeline. Go directly to an issue, or delve further into your research by using links that search the Collection for key events on various markers. The Timeline even allows you to save favorite events for later reference! the original publishers of the materials in this collection.